When Guthrie Hewitt calls on restaurateur and private investigator Jane Lawless, he doesn't know where else he can turn. Guthrie has fallen for a girl-Kira Adler. In fact, he was planning to propose to her on Christmas Eve. But his trip home with Kira over Thanksgiving made him uneasy. All her life, Kira has been haunted by a dream-a nightmare, really. In the dream, she witnesses her mother being murdered. She knows it can't be true because the dream doesn't line up with the facts of her mother's death. But after visiting Kira's home for the first time, and receiving a disturbing anonymous package in the mail, Guthrie starts to wonder if Kira's dream might hold more truth than she knows. When Kira's called home again for a family meeting, Guthrie knows he needs Jane's help to figure out the truth, before the web of secrets Kira's family has been spinning all these years ensnares Kira too. And Jane's investigation will carry her deep into the center of a close-knit family that is not only fraying at the edges, but about to burst apart. 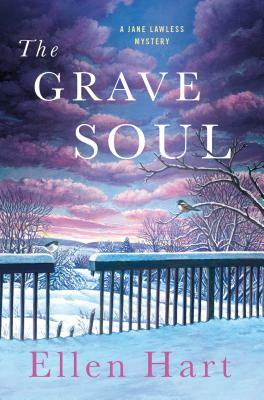 In The Grave Soul, MWA Grand Master Ellen Hart once again brings her intimate voice to the story of a family and the secrets that can build and destroy lives. ELLEN HART, "a top novelist in the cultishly popular gay mystery genre" (Entertainment Weekly), is also a Lambda and Minnesota Book Award winner. The author of more than twenty previous mysteries featuring Jane Lawless, she lives in Minneapolis, Minnesota.